Does your dog always stare at the fence and wonder what’s on the other side? Well, now he won’t have to wonder anymore. With the Pet Peek, your dog can check out what’s going on in the neighborhood and it can satisfy all of his curiosity (or yours too — if you want to spy on your neighbors). 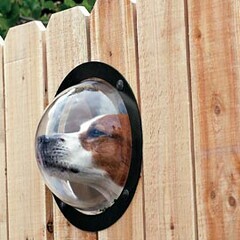 Now your dog will be the Peeping Spot of the neighborhood. This entry was posted on Friday, May 4th, 2007 at 3:50 am	and is filed under Dogs, National Dog, Cat & Pet Info, Products & Services for Cats & Dogs. You can follow any responses to this entry through the RSS 2.0 feed. Both comments and pings are currently closed.